A tiny community in rural Ghana recently discovered that the religion they have been practicing for centuries is Judaism. Filmmaker Gabrielle Zilkha explores their story from isolation to global connection and the challenges and rewards they face along the way. This is a story, not of the history of a tribe of people in Ghana, but rather of the people who are currently living there. 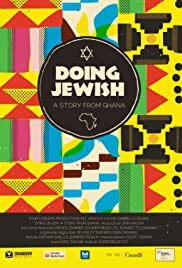 When first reading the description of the movie, the initial impulse is to think this will explain how there are a small amount of Jews in Ghana. What it in fact becomes is a story of the filmmaker and her discovery of a community in Ghana and how it's surviving in the current age. The film kicks off with a woman's journey to Ghana on a humanitarian mission. Due to her Jewish roots, and the Jewish holidays, she comes across a tribe of what appear to be Jews in Ghana, and goes about getting in contact with them. From there, a brief history is given on how these people in Ghana came to be Jews (always were Jews? ), but it quickly moves to tackling how a small community survives in a small isolated area. The movie may not translate to all, and may be dull to some if not interested in the subject matter. But if you have an interest in Judaism, or religion in general, the story is ultimately one of hope, told in an entertaining way.